The Trump administration said it will phase out the Obama-era program protecting from deportation some 800,000 illegal immigrants who were underage when they arrived. The US Congress will have six months to pass a law regulating their status. 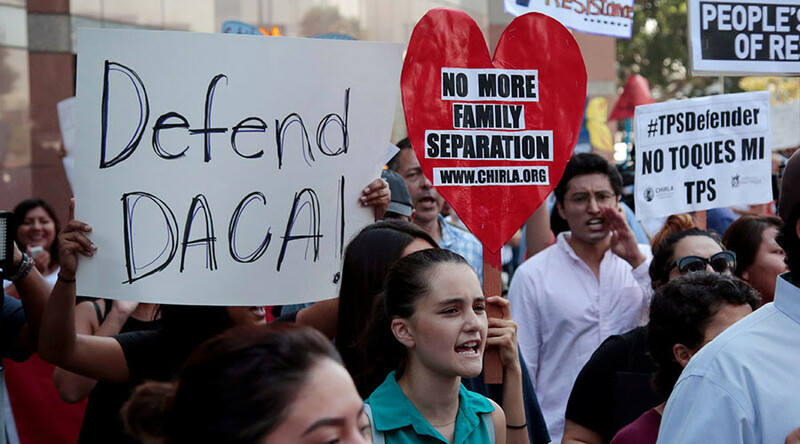 Attorney General Jeff Sessions announced the decision to rescind the Deferred Action for Childhood Arrivals (DACA) program on Tuesday. "This policy was implemented unilaterally to great controversy and legal concern after Congress rejected legislative proposals to extend similar benefits on numerous occasions to this same group of illegal aliens," Sessions said in a press appearance at the Department of Justice. The Department of Homeland Security has been asked to conduct an “orderly, lawful wind-down” of the program, Sessions said, calling DACA “unconstitutional” in character. Sessions called the measure a "unilateral executive amnesty" that deliberately circumvented the legislative process. “There is nothing compassionate about the failure to enforce immigration laws,” the AG added. His remarks were echoed by White House press secretary Sarah Huckabee Sanders later in the day. Congress will have six months to pass a law that would regulate the status of people who were brought into the US illegally as children. Under the program, some 800,000 of them were granted temporary protection from deportation by President Barack Obama’s executive action in 2012. No one currently on DACA will be impacted before March 5, 2018, “so Congress can have time to deliver on appropriate legislative solutions," acting Homeland Security Secretary Elaine Duke said in a statement. "There can be no path to principled immigration reform if the executive branch is able to rewrite or nullify federal laws at will," President Donald Trump said on Tuesday. "Congress now has the opportunity to advance responsible immigration reform that puts American jobs and American security first," Trump added, referring to the RAISE Act proposed by two Republican lawmakers that he endorsed in early August. In addition to the minority Democrats, a number of Republican lawmakers have expressed support for keeping DACA, including Speaker of the House Paul Ryan (R-Wisconsin). Senator Lindsey Graham (R-South Carolina) publicly endorsed the DREAM Act in a joint appearance with Durbin on Tuesday afternoon. Trump "did the country a service" by returning the issue to Congress, Graham said, urging the president to "get involved personally" in getting the law passed. A number of prominent business leaders, including Facebook CEO Mark Zuckerberg and Apple CEO Tim Cook, have also publicly endorsed DACA. Explaining the decision to rescind DACA, Trump said that none of the program’s beneficiaries will be affected right away. All existing work permits will be honored until they expire, in up to two years from September 5, but no new permit applications will be accepted. DHS has also been told that DACA recipients are not a priority for deportation “unless they are criminals, are involved in criminal activity, or are members of a gang,” Trump said.